Language*: Mary Jessie MacFarlane spoke English. Name Variation: Mary Jessie MacFarlane was also known as MJ MacFarlane. Biography*: According to the census MJ could both read and write in 1891. MJ trained as a psychiatric nurse at Boston State Hospital. She then worked for several years at Bellevue Hospital in New York City. In 1918 she joined the Nurse Corps of the American Expeditionary Force. She was soon sent to France where she served with distinction in several Base Hospitals through the Armistice and beyond. On her return to the United States she continued her nursing career, working with both the American Red Cross and the Veterans' Administration. [S9] Births, Church Record, June 1977 to September 1944 St. Joseph's Church, Margaree, Records, page 10, line 17. [S861] Ancestry.com, online www.ancestry.com, 0861 - 0061b - Mary Jessie MacFarlane.docx. [S861] Ancestry.com, online www.ancestry.com, 0861 - 0061 - Mary Jessie MacFarlane.docx. Religion*: John Hugh MacFarlane was Roman Catholic. [S9] Births, Church Record, June 1977 to September 1944 St. Joseph's Church, Margaree, Records, page 16, line 1. [S5] Marriage, Church Record, November 1884 to September 1935 St. Joseph's Church, Margaree, Records, page 99, line 1. [S861] Ancestry.com, online www.ancestry.com, http://search.ancestry.com/cgi-bin/sse.dll,%20canada&msbpn=5005&msdpn__ftp=nova%20scotia,%20canada&msdpn=5005. Married Name: As of November 1912,her married name was Davidson. [S9] Births, Church Record, June 1977 to September 1944 St. Joseph's Church, Margaree, Records, page 12, line 24. [S861] Ancestry.com, online www.ancestry.com, 0861 - 0234 - George Davidson.docx. [S861] Ancestry.com, online www.ancestry.com, 0861 - 0234b - George Davidson.docx. [S861] Ancestry.com, online www.ancestry.com, 0861 - 0234f - George Davidson.docx. [S861] Ancestry.com, online www.ancestry.com, 0861 - 0234g - George Davidson.docx. [S861] Ancestry.com, online www.ancestry.com, 0861 - 0234e - George Davidson.docx. [S7] Certificate, unknown spouses' names marriage. [S5] Marriage, Church Record, November 1884 to September 1935 St. Joseph's Church, Margaree, Records, page 92, line 17. [S427] CBGHA, online www.cbgha.org, September 2004 E-zine. Obit Index of CB Post Jan 2004 to June 2004, transcribed by Bob Thompson. Biography*: According to the 1871 Canada Census John could both read and write. According to the 1871 Census John owned a farm of 100 acres, one village building lot with one dwelling house and two warehouses or stores. He owned one car, wagon or sled. He occupied 100 acres, 20 of which were improved, 15 acres in pasture. One acre of potatoes yielded 120 bushels. five acres of hay yielded six tons. Language: Angus MacFarlane spoke Scotch Gaelic. [S100] Obituaries from The Casket Newspaper, 1852 - present, Obituary of Jessie MacFarlane, 46-1897-50-5. Religion*: Dougald John MacFarlane was Roman Catholic. Biography*: According to the 1871 Canada Census Dougall could read and write. 0861 - 0069 - Mary MacFarlane.docx. 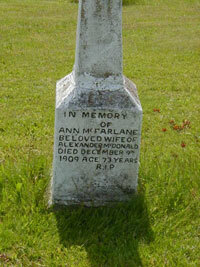 Name-Comm: Her common name was Nancy MacFarlane. 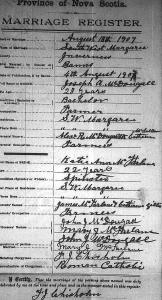 Year: 1901; Census Place: Margaree Harbour (West/Ouest), Inverness, Nova Scotia; Page: 2; Family No: 10. [S709] Diocese of Antigonish, Nova Scotia, Canada , Baptismal record of Margaret MacDougall, page 38. Religion*: Angus [The Miller] MacFarlane Senior was Roman Catholic. Biography*: From the 1871 Census we get a snapshot of Angus' two mills. At the time of the Census Angus declared for the grist mill an investment in fixed capital of $1600.00 and in floating capital of $40.00. The mill was worked eight months a year with one male employee who received a yearly wage of $192.00. The mill was powered by water with a nominal force of 16 (horsepower?). The raw material was assorted grains totaling 5400 bushels in the past year to an aggregate value of $2700.00. The product of the mill was flour and meal totaling 415 barrels with a value of $3490.00. The saw mill had a fixed capital value of $600.00 and a floating capital value of $30.00. It ran 12 months a year with two employees who received $400.00 in wages. The saw mill was powered by water with a nominal force of 16 (horsepower?). Twenty-five hundred logs with a value of $1000.00 were converted into 250,000 board feet of boards and lumber valued at $2250.00. [S341] Registration form to Gathering 2001 Committee, August 3, 2001, Sheets 2, 3, 69, 71. [S807] 1861 Digital, unknown repository address, Library and Archives Canada. [S384] 1871 Canada Federal Census, 101 Newbury Street, Boston, Suffolk, Massachusetts, USA. At S. W. Margaree, 8th May, 1907, after a few month's illness, Malcolm MacFarlane (Big), aged 95 years. He was born at South River, Antigonish, in March 1812 and moved with his father's family to a farm at S. W. Chapel in 1822, where he passed the rest of his life, a period of 85 years His career, like that of the generality of farmers, to the human eye appears uneventful. But the fruits and the far reaching effects of 85 years of unremitting, honest intelligent labor are known only to his maker. "Big Malcolm's" name was always associated with every progressive movement in school, parish and district work, he would always be found in the front ranks and was often their trusted, chosen leader. His hospitality & cheerful disposition were proverbial and oh! how we shall miss the venerable presence, his hearty laugh as well as his fund of interesting anecdotes which seemed inexhaustible. He was twice married, first to Catherine Gillis of Morar, Scotland, by whom he had 5 children. The second time to Sarah McLellan of the South West, by whom he had ten children. His grand and great grand children are numerous and there is one great, great grand child. Biography*: The 1881 Census lists Malcolm as a farmer. According to the 1891 Census Malcolm was a farmer could both read and write. There were two houses on the property, both one and a half story of wooden construction. One had five rooms and the other nine. [S806] 1861 Digital, unknown repository address, Library and Archives Canada. Religion*: James MacFarlane was Roman Catholic. 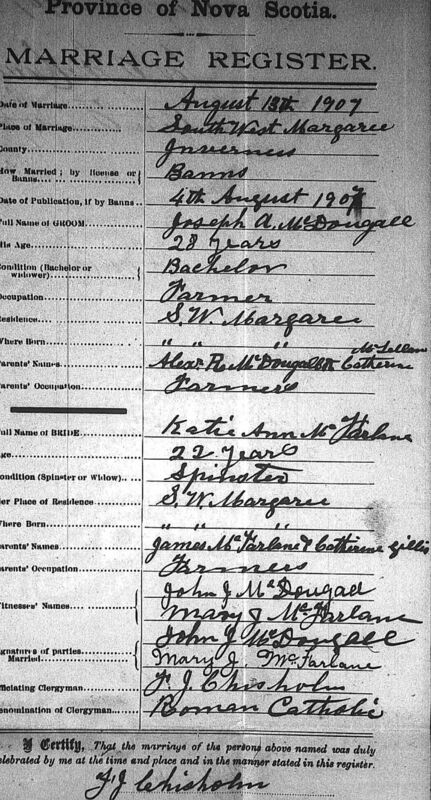 Biography*: The 1871 Census lists James as a farmer who could both read and write. The 1881 Census lists James as a farmer. [S804] 1861 Digital, unknown repository address, Library and Archives Canada. Married Name: As of circa 1830,her married name was Gillis. [S1] J. L. MacDougall History of Inveness County, pages 402, 403. Birth*: Christy was born circa 1820 in South River, Antigonish, Nova Scotia, Canada. Death*: Christy died circa 1822 in Nova Scotia, Canada. [S100] Obituaries from The Casket Newspaper, 1852 - present, Obituary of Gillis (Peter), Ann, 1901-30-5. Name-Gaelic: Isabel MacFarlane was also known in Gaelic as Ishabel. [S341] Registration form to Gathering 2001 Committee, August 3, 2001, Sheets 5, 66. Ancestry.com and The Church of Jesus Christ of Latter-day Saints.1881 Census of Canada[database on-line]. Provo, UT, USA: Ancestry.com Operations Inc, 2009. Married Name: As of circa 1840,her married name was MacLellan. [S701] Certificate, see memo marriage of 1862-1908, Gillis-McLellan 1880 October 12. [S362] 1881 Canada Federal Census, 101 Newbury Street, Boston, Suffolk, Massachusetts, USA. Language*: Dougald MacFarlane spoke Scotch Gaelic. Biography*: Dougald and Catherine had six sons and five daughters all of whom except Christy, who died young, lived to an advanced age. Nova Scotia Archives; Halifax, Nova Scotia, Canada; Census, Assesment and Poll Tax Records 1767-1827; Reference: Commissioner of Public Records Nova Scotia Archives RG 1 vol. 449 no. 134. [S266] April 16, 1901 Canada Federal Census, 101 Newbury Street, Boston, Suffolk, Massachusetts, USA. [S341] Registration form to Gathering 2001 Committee, August 3, 2001, Sheets 16, 31, 48, 62, 72. [S100] Obituaries from The Casket Newspaper, 1852 - present, Obituary of Dougald MacFarlane, 64-1916-17-5. [S341] Registration form to Gathering 2001 Committee, August 3, 2001, sheets 42, 44, 53, 60, 72. [S100] Obituaries from The Casket Newspaper, 1852 - present, Obituary of Mrs. Dougald MacFarlane, 57-1909-19-5. [S770] Nova Scotia Historical Vital Statistics, online https://www.novascotiagenealogy.com/, Registration year 1867, Book 1814, page 55, no. 82. [S709] Diocese of Antigonish, Nova Scotia, Canada , Baptismal record of Margaret MacFarlane, page 5. [S709] Diocese of Antigonish, Nova Scotia, Canada , Baptismal record of Ronald MacFarlane, page 8. [S709] Diocese of Antigonish, Nova Scotia, Canada , Baptismal record of Mary McFarlane, page 68. [S709] Diocese of Antigonish, Nova Scotia, Canada , Baptismal record of Arch McFarlane, page 69. [S770] Nova Scotia Historical Vital Statistics, online https://www.novascotiagenealogy.com/, Registration year 1950, page 6063. [S770] Nova Scotia Historical Vital Statistics, online https://www.novascotiagenealogy.com/, Registration year 1876, book 1815, page 44, no. 310. Nova Scotia Archives; Halifax, Nova Scotia, Canada;Death Registrations: 1864–1877; 1908–1966; Volume Number:37; Page Number:323; Reference Number:793. [S805] 1861 Digital, unknown repository address, Library and Archives Canada. [S701] Certificate, see memo marriage of 1862-1908, McEachern-McFarlane 1882. [S100] Obituaries from The Casket Newspaper, 1852 - present, Obituary of John A. McFarlane, 44-1896-51-5. Name Variation: Patrick MacFarlane was also known as Peter MacFarlane. [S258] 1891 Federal Canadian Census, 101 Newbury Street, Boston, Suffolk, Massachusetts, USA. [S186] Patrick (Peter) MacFarlane Monument Inscription, Donald James MacFarlane, Meredith, Belknap, New Hampshire, USA. [S295] e-mail address, "Antigonish School Returns," e-mail to Donald James MacFarlane, September 24, 2000. Name-Gaelic: John MacFarlane was also known in Gaelic as Iain Mac Dhoughaill. I John McFarlane of Margaree in the County of Cape Breton and Province of Nova Scotia same being through the blessing of God in a sound state of mind and memory but calling to mind the frail nature of this life and that it is appointed to all men once to die: do make and ordain this last will and testament. That is, today, I give, bequeath and dispense of it in the manner and proportions here following. First, I give and bequeath to my beloved wife Catherine McInnis one hundred acres of the south side of my land on which the improvements, and with the marsh or north meadow under her command during her life time with the dwelling house and other buildings together with all that stock, household furnishings. She paying all my legal debts out of the present property and maintaining together with their own labor all my beloved family as follows: Viz. I desire that my beloved son Angus shall reside with his mother while she is alive and beyond to him at her death the above stated 100 acres of land with the dam privileges as described above. I bequeath and bequest that they give and bequeath to my beloved son John all the aid they possibly can as they and my executors may think proper. I bequeath and bequest that they pay to my beloved sons Dougald, Patrick and Alexander the sum of twenty pounds cash out of the products of the aforesaid property after they attain their twenty-first year of age in order to better themselves as they deem fit and also that they settle my beloved daughters Isabella, Margaret and Nancy, if blessed with marriage, as it is the custom of others of equal property in this vicinity. I give and bequeath to my daughters Mary and Catherine the sum of one shilling each. I bequeath and give to much beloved James one acre of the north side of my lot or adjoining Peter O’Quinn’s lot with the privilege to plough, plant and mow a small portion of the other half while his mother is alive. And at her death to have one half of the marsh or meadow, Angus to have the other half. Finally I make and appoint Archd. McFarlane and John McFarlane of the S. W. Branch my sole executors of this my last will and testament. In witness whereof I have hereunto set my hand and seal subscribed (XXXX) at Margaree this thirteenth day of April in the year of our Lord one thousand eight hundred and thirty-four. That on the sixteenth day of September in the year of our Lord one thousand eight hundred and thirty-four before me the last will and testament of John McFarlane late of Margaree in the County of Inverness hereunto deceased was proved, affirmed and perfected. The said deceased having while living and at the time of his death goods, chattels and credits within the said County by reason whereof the proving and perfecting the said will and granting administration of all and singular the said goods, chattels and credits and also the auditing, allowing and final discharging the accounts thereof are well known to appertain only and wholly to us and not to any others and that administration of all and singular the goods, chattels and credits of the said deceased any way concerning his will was granted to Archibald McFarlane and John McFarlane of Margaree, Executors named in the said will being first well and faithfully to administer the same and to make a true and perfect inventory of all and singular the said goods, chattels and credits and to exhibit the same unto the Registry of our said Court on or before the ninth day of July next ensuing and also to render a just and true account thereof and to do and perform all such other acts, matters and things as to the true and faithful administration thereof may or shall lawfully appertain when thereunto required. Given the sixth day of April in the year of our Lord one thousand eight hundred and fifty-one under the seal of the said Court. [S497] St. Michael's Parish Record, East Margaree, online www3.nf.sympatico.ca/trish.leblanc/stmichaels.html, page 24. [S100] Obituaries from The Casket Newspaper, 1852 - present, Obituary of Mrs. John MacFarlane, (Catherine), 10-1862-28-3. [S497] St. Michael's Parish Record, East Margaree, online www3.nf.sympatico.ca/trish.leblanc/stmichaels.html, page 2, 3, 4, 24. Ancestry.com. Ontario and Nova Scotia, Census, 1800-1842 [database on-line]. Provo, UT, USA: Ancestry.com Operations Inc, 2005. Nova Scotia Archives; Halifax, Nova Scotia, Canada; Census, Assesment and Poll Tax Records 1767-1827; Reference: Commissioner of Public Records Nova Scotia Archives RG 1 vol. 445 no. 17. [S262] Dr. Raymond A. MacLean, History of Antigonish, Volume 2, Page 122, note 127. [S183] Angus McFarlane Monument inscription, Donald James MacFarlane, Meredith, Belknap, New Hampshire, USA. [S262] Dr. Raymond A. MacLean, History of Antigonish, Volume 2, page 122 note 128. [S100] Obituaries from The Casket Newspaper, 1852 - present, Obituary of Mrs Angus MacFarlane (Catherine), 22-1874-31-2. [S709] Diocese of Antigonish, Nova Scotia, Canada , Baptismal record of Andrew McPharlane, page 152. [S705] Unknown name of person Monument, Donald James MacFarlane, Meredith, Belknap, New Hampshire, USA, Angus MacFarlane monument. [S33] Vital statistics from The Weekly Doings;. Married Name: As of circa 1810,her married name was MacPherson. [S234] The McPhersons, December 18, 1913, page 71. [S234] The McPhersons, December 18, 1913, pages 71-72.